The Table Appearance toolpart allows you to modify the appearance of the PivotPoint web part to fit in with your site. Border, Cell Padding and Cell Spacing (values in pixels) change how the HTML table is rendered. 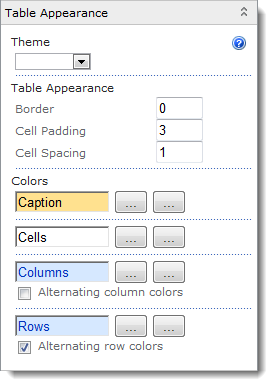 You can also change the text and background colors used for theCaption, Cells and Row and Column headers. The builder button (...) on the left allows you to pick a background color, the one to the right is for the text color. You can choose Alternating row and column colors that will use a slightly darker color on every 2nd row or column - helping you to line up cells with their corresponding row and column.